House hunting is obviously a big deal on TV, but there is also a certain art to apartment hunting that doesn’t get covered by HGTV. You have to know what to look for, what questions to ask the landlord, and what resources are there to help you. Among all these questions is the question of timing. Do you know when you should be looking? 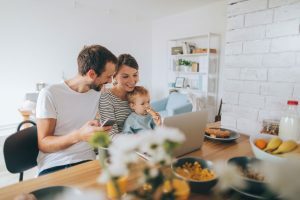 There are plenty of considerations that go into deciding the best time to move into an apartment, and it all depends on what you value in your search. As the weather warms up, so does the apartment hunting season. April–August signal the most popular months to move, especially in seasonal areas (honestly, who wants to move during a snowstorm?). This makes for a larger amount of apartments being listed during these months. If you are looking for as many options as possible you want to focus your hunt during spring and summer. People prefer to move in the spring and summer due to how much easier it is. People that live in areas with varying seasons, such as the Midwest, view warmer months as a window of opportunity. They know harsh temperatures and winter snowfall make moving so much more complicated (and even dangerous). Unless you have a moving crew that you trust or plan to hire professional movers, it is highly preferable to move while it is warm out and the ground is clear of snow and ice. The popularity of the spring and summer season for apartment hunting does come with its own share of downsides. First of all, the fact that apartment hunting heats up in the summer isn’t exactly a secret — which means you’ll be facing more competition. There may be more apartment options, but you will have to act fast if you want to secure your spot, as each listing will have multiple interested candidates. Be prepared to apply as soon as you find an apartment you like. Unfortunately, landlords also know that spring and summer are the go-to seasons for apartment hunting. They understand that people prefer to move when it’s warm out, and they leverage this by raising their prices around this time. Although it usually isn’t too drastic of an increase, it can oftentimes be the make-or-break difference when you are trying to settle on a place. Be mindful of this increase when you are browsing, and ask yourself if you think you could get a similar place for a lower price later on in the year. Although spring and summer are the more popular seasons for apartment shopping, there are still plenty of great upsides to the colder months. For starters, while the spring and summer months cause an increase in rent prices, the exact opposite happens during the fall and winter months. Landlords realize that not as many people are looking for an apartment, and since they need to fill their properties, they are more likely to negotiate rent rates. This usually means that fall and winter are the cheapest time of the year to move. This is incredibly advantageous for people who are on a budget and want to get a great apartment at a more affordable price. The colder months also signify a decrease in fellow apartment hunters. This means you’ll be facing less competition. Although this might not change your strategy too much, it still allows you a little bit of breathing room when you are searching. You don’t need to work your schedule around different tours or check your email every few minutes for new listings. Simply put, the colder months allow you some slack. The colder months come with their fair share of disadvantages. As mentioned earlier, for seasonal regions the wintertime can be tricky and borderline hazardous for moving. Having to move heavy objects with ice below your feet can be dangerous to not only your items but to the people moving as well. Unless you have a moving team hired or a crew of people that you trust completely, it isn’t advised to move when there is ice or snow on the ground. Depending on your area, there might not be a great number of apartments available during the fall and winter. If you live in a college town, most of the apartments fill up by the end of the summer, and they won’t open up again until the spring. In general, there are fewer apartments available in the colder months due to typical lease cycles favoring the spring and summer seasons. That’s not to say you can’t find a great apartment in December, but the likelihood of it is slimmer. Believe it or not, what days of the month you apartment shop might play an impact on the type of apartment you are able to find. If you look at the beginning of the month, you are going to see more options. It’s no secret leases usually starting on the first day of the month, so there is always going to be fresh listings at the beginning of every month once people leave. The prices will be higher, but the options will be plentiful. If you are looking to get a bargain and have nerves of steel, wait until the end of the month. As apartments continue to go unsigned, landlords become more desperate to put people in their buildings. This leads them to lowering their prices in the hopes to attract people to sign before they lose out on an entire month’s rent. For those that are willing to wait it out, you can really get a good deal on your rent by waiting. Remember: patience is a virtue! Just like in real estate, when apartment hunting, location is crucial. Where you live can play a big impact into the availability of apartments. For example, if you live in a college town, the apartment availability cycles with the school year. If you live somewhere that experiences an influx in population seasonally (such as Arizona or Florida), you will need to take that into consideration. If you want more information on your city and the trends, check out City-Data. Apartment hunting is an exciting (yet sometimes stressful) time. You want to make sure that wherever you end up living has all of the amenities you want without breaking the bank. No matter what season it is or what time of the month it is, REE Apartments always has a great selection of apartments. We have everything from high-end luxury apartments to smaller, more affordable apartments, so no matter what you’re looking for in a home, we have options. Find your next apartment today!